The CalendarPlugin can be used to generate a monthly calendar in a wiki page. It's handy for PersonalWiki?s. Individual dates in the calendar link to specially named wiki pages. The names for the "day pages" are by default formed by appending the date to the pagename on which the calendar appears. This feature was inspired by Manila, and first implemented by GaryBenson?. It was later implemented as a WikiPlugin? by JeffDairiki?. Added to month. Can be used to include several months worth of calendars on a single wiki page. 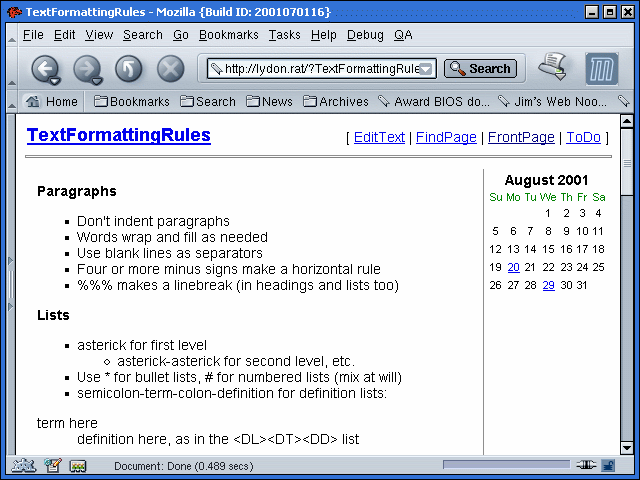 Strftime style format string used to generate page names for the "day pages." The default value is '%Y-%m-%d'. Prepended to the date (formatted per date_format) to generate the "day page" names. The default value is '[pagename]:'. Strftime style format string used to generate the day-of-week names at the top of the calendar. What day of the week does the calendar start on. This should be specified as an integer in the range zero (Sunday) through six (Saturday), inclusive.